What In The World Is PEX TUBING? PEX is a cross-linked polyethylene tubing called HDPE (high-density polyethylene). 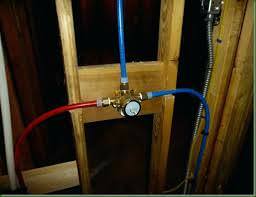 PEX provides an excellent option over copper pipe for plumbing systems in both residential and commercial plumbing applications. Due to its flexibility, PEX pipe is easier to install than rigid pipe, and it is available in long coils that can eliminate the need for extra fittings. PEX pipe is flexible and can be navigated around obstacles. To make PEX, HDPE is melted and continuously extruded into a tube to form a high-performing pipe suitable for a variety of plumbing applications. It is available in red, white, blue and gray all are intended for use in potable water systems. The colors allow plumbers to distinguish between hot and cold distribution lines. PEX pipe does not require glue or cement, and can simply be joined with push-fit fittings, metal insert fittings, or plastic insert fittings for a watertight seal. PEX has a 25-year warranty and has been used in Europe for decades with great success. The next time you visit the plumbing department at your local Home Depot, check out the PEX tubing.